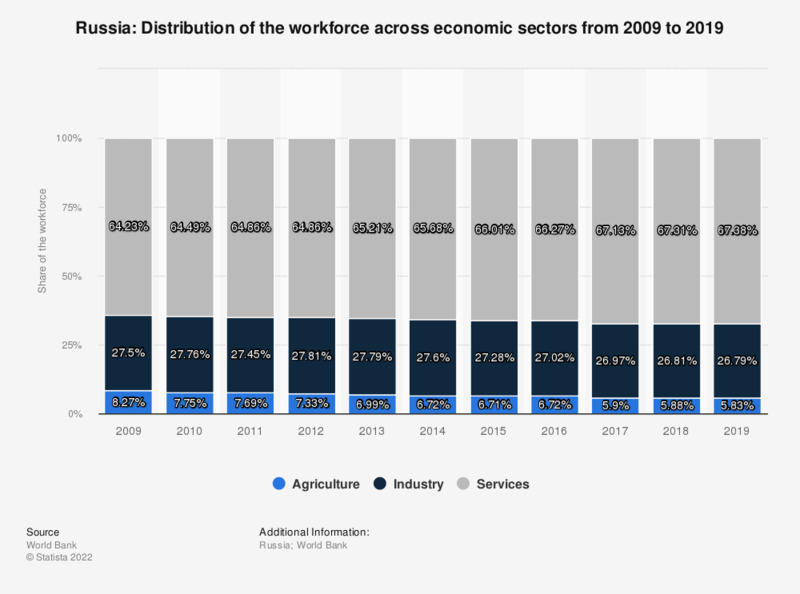 The statistic shows the distribution of the workforce across economic sectors in Russia from 2007 to 2017. In 2017, 6.7 percent of the workforce in Russia was employed in agriculture, 26.88 percent in industry and 66.42 percent in services. The majority of Russia’s labor force works in the services sector, which accounts for more than half of the jobs in the country. About 30 percent work in the industry sector and the rest in agriculture. Interestingly, Russia is among the leading export countries worldwide and agricultural products, as well as meat, are among the main exported goods. Russia’s economy also profits significantly from selling and exporting fish and sea food. Due to large oil resources, Russia is also among the largest economies and the countries with the largest gross domestic product / GDP worldwide. Subsequently, living and working conditions in Russia should be above average, but for a long time, many Russians have struggled to get by. While conditions seem to improve nowadays, many Russians still live below the poverty line. One suggested reason for this is corruption, which has been cited as a severe problem for the country for a long time, and continues to pose difficulties for Russia’s economy. Illicit employment and the so-called “shadow economy”, which does not officially contribute to the fiscal system, yields amounts worth almost half of Russia’s gross domestic product. This can be seen on a ranking of the untaxed economy in selected countries as a share of GDP. In addition to oil, fish and agricultural products, Russia also manufactures and exports arms and weapons. It is ranked third among the countries with the highest military spending, and second among the countries, in which military spending accounts for a significant percentage of the gross domestic product.